They like you very much, but they are not the hell “your” whales. So we’re talking about Nimoy, huh? Okay. Fine. But how about this. Let’s not talk about Spock; or at least, let’s talk about Spock at a remove. The Star Trek franchise was at yet another crossroads between life and death. The public and critical support for The Wrath Of Khan made it relevant again. The scene-chewing in The Search For Spock dropped it back down to its metaphorical knees. Paramount needed a savior for its franchise, but the company was also crazy enough to say yes to virtually anything. And here it is: turn it into an ecology-loving, screwball romantic comedy. And let Leonard Nimoy direct it, even though his returns as director on the aforementioned Search For Spock were quite unhappy. Yes, it sounded crazy, but like a million sitcoms and wartime dramas persuaded us, it was so crazy it just might work. And did it ever. The plot for Star Trek: The Voyage Home centers around an object entering future-Earth’s orbit, causing havoc with the atmosphere with its mass and its undefinable noise. The renegade former crew of the Starship Enterprise knows what it is and what it wants…to talk. Problem is it wants to talk in whale, and man made the whales extinct long before Earth’s second enlightenment, before Zefram Cochrane reached out to the stars. The object won’t stop until it hears back from it’s terrestrial brother, and that spells doom for Earth. Defying authority once again, Capt. Kirk and co. slingshot back in time to do…they’re not quite sure. Very strange things occur. 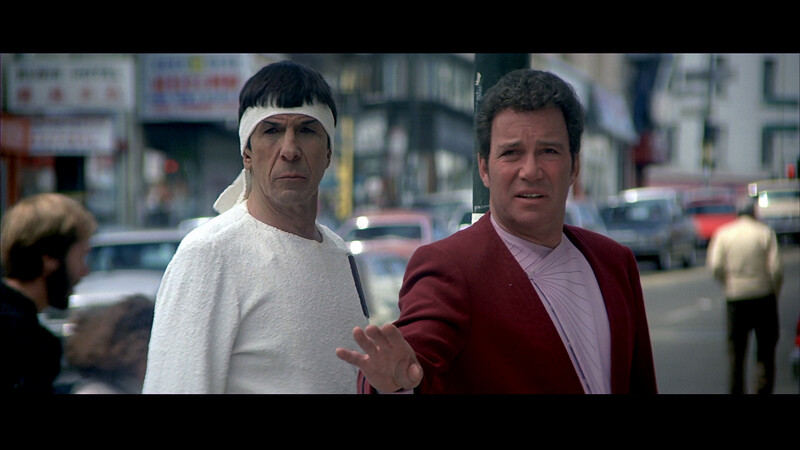 Still trying to get his old Vulcan brains back together, Spock attempts to make peace with where they land, the 1980s, only to realize we were really screwed up back then. After hearing Kirk utter some profanity, Spock peppers his statements liberally throughout with hells and damns. He mind-melds with a whale. He gives an obnoxious punk with a boombox the nerve pinch. The bus full of irritated passengers cheer. Scotty, not used to primitive computers, talks to a desktop PC and nothing happens. He talks to a mouse, and still nothing happens. Chekhov, in the midst of Cold War era San Francisco, has to go to the Navy yards with Uhura. He falls and is shipped off to the hospital. Bones has to rescue him, and is appalled by the late-20th century healthcare system. Kirk, as he is known to do, meets cute with a cetologist. In a first for such types of movies, she’s not buying his crap about where Kirk says he’s from. She knows he ain’t from around these parts, but hasn’t got a fix on exactly how far out he really is. And Spock rides the fifth hell-damn wheel. It all sounds absurd, and it is, but it strides such a deft line between honoring the series and its fans and totally disrespecting both. (William Shatner would do that with installment number 5, turning it into a god-complex flick with slapstick.) The credit has to go to Nimoy as director, so intimate with what the fans wanted and would tolerate, yet in full knowledge that he had to break the form just a little bit to remake it. This time out, freed from the solemnity of what the hierarchy said Trek was to be and had to be, everything worked with shocking precision and great fun. Nimoy would also direct the big comedy hit Three Men and a Baby, the movie that made bigger stars of Ted Danson and Tom Selleck, and alerted the aliens that Steve Gutenberg was ready to be abducted. There are going to be a lot of moribund, dour, mournful tributes to Spock today. Nimoy meant a lot to generations of fans. They’ll forget the Mission: Impossible years. They’ll casually glance over the turdfest that was Star Trek: Into Darkness. And they have every right to do so. I say that Leonard Nimoy was the one out of Star Trek’s first wave with the influence and light touch to say, “Let’s put on a smile.” It worked. He’ll be missed.